Oshkosh Defense has started the production and deployment phase of the US Marine Corps' (USMC) P-19 replacement (P-19R) aircraft rescue fire fighting (ARFF) vehicle programme. The USMC's P-19R ARFF vehicle programme seeks to provide marines with superior off-road capability, speed and transportability to better respond to an entire range of firefighting missions in future. Awarded in May 2013, the P-19R contract has a performance period that runs up to 2018 and aims to replace the 1984 deployed P-19A fleet, which is nearing the end of its service life. Since then, Oshkosh has successfully completed all necessary government development testing and evaluation and readiness reviews to achieve Milestone C approval and low rate initial production (LRIP) contract. Oshkosh Defense, defence programmes senior vice-president John Bryant said: "The Oshkosh P-19R is backed by our company's unique combination of industry leading off-road military vehicle and ARFF expertise, providing marines with the latest innovative technology whether they're at a military base or an expeditionary airfield. "Consistent with our strong track record of delivering programmes on-schedule and on-budget, we're proud to deliver the new P-19R capabilities and safety that marines need for future fire-emergency missions." 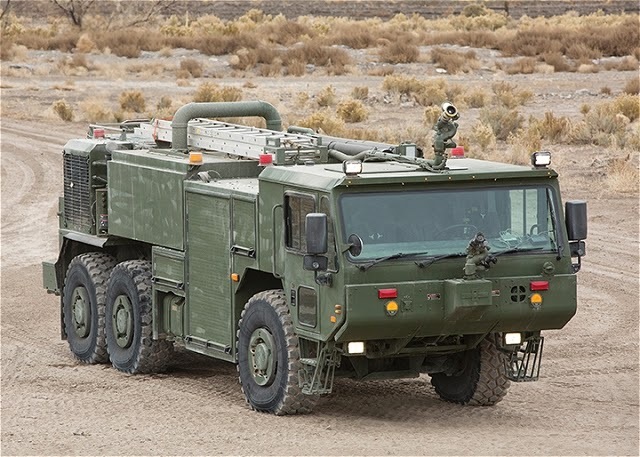 The P-19R vehicle is equipped with Oshkosh's TAK-4 independent suspension system, Command Zone, an integrated control and diagnostics system, and advanced Striker firefighting systems. Its 600 horsepower engine enables the vehicle to deliver unprecedented levels of performance and speeds of up to 70mph. Oshkosh's TAK-4 independent suspension system provides the payload capacity needed to carry 1,000 gallons of water, 130 gallons of foam agent, and 500lb of Halotron auxiliary firefighting agent. The fully-automated Command Zone system allows marines to repair and troubleshoot vehicles, view real-time performance data and remotely access diagnostics information. Oshkosh will start delivering the first LRIP vehicles to support production verification testing (PVT) in November.